amethyst gemstone ring to enhance your personal magnetism and to provide mental clarity. Amethyst is also helpful for migraines, arthritic pains, and connecting to one’s spirituality for guidance. Diamond power becomes activated and can be used for manifesting abundance and increasing personal self-esteem. It is a token of one’s love to another, and both enhances and radiates the beauty of the wearer. The diamond is also known for invincibility, representing the life force (prana). effects, tape a small half-inch piece at the Hara Centre – one and one-half inches below the navel – and wear it overnight. more practical and focused. As a “Stress Stone”, Hematite reflects negativity back to the sender, so you don’t end up with someone else’s stress. For backache or leg cramps, use surgical tape to fix a few pieces onto painful areas. The crystal’s energy is like a magnet and effectively draws out pain related to muscular or joint alignment problems. Hematite is also used to reduce insomnia. Jade gets darker with good health and lighter with declining health. Jade soothes the emotions, and provides emotional detachment and restoration after various traumas such as minor surgery, divorce, funerals, or loss of job. Some say it is for good luck. Jade is a stone which is easily obtained in most city centers and can be openly worn as a pendant. “The Stone of The Pharaohs”. Lapis Lazuli is well-known as a favorite stone used in the courts of the ancient Egyptian Kings. 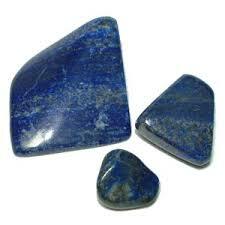 Lapis (stone) Lazuli (blue) is used for stimulating mental strength and intellectual precision. Lapis is a consciousness elevator, raising one’s awareness to new heights and to greater expansion. It brings feelings of success and connected-ness and protection. For intuitive people, Lapis intensifies psychic power. (tumors, swollen joints, muscular). 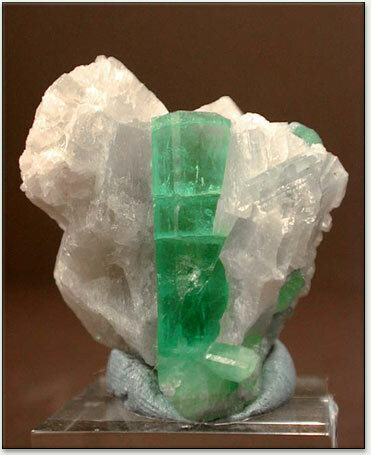 Malachite promotes business relationships and the increase of wealth by removing obstacles to one’s growth. The most important aspect of this crystal’s healing ability however, is for the preventative health of the physical heart and liver. If you are attracted to this crystal, chances are you have a family history of heart-related problems and probably need a heart check-up. “The Feminine Balancing Crystal”. To soften and balance dominant male attributes with some feminine qualities, Moonstone provides for a depth of perception and feelings, discernment, creativity and self-expression. Other properties of Moonstone include: increases awareness and focus, releases one’s intuition, rejuvenating qualities for the skin and hair (baldness? ), reduces water retention, and protection for travelers. Moonstones increase their powers before and during the full moon, so leave them out at night to soak up the moon’s rays. stimulating greater flexibility in communications. It mellows out a reluctant Heart, and provides peace in relationships through harmony. 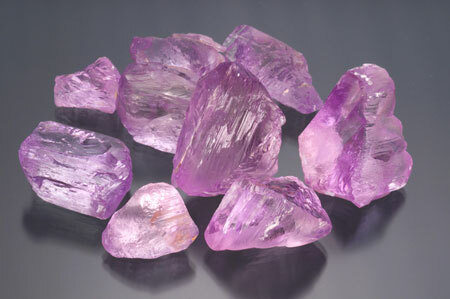 Rose Quartz is used for meditation, as it stills one’s aggressive thoughts and provides mental tranquillity. It can heal a broken heart very quickly too. responsibility for yourself, and to broaden your capacity for effective communication by dissolving self-limiting perceptions. Helps you to understand the mind. Expands your viewpoint. It is good for connecting the heart and the mind when worn over the heart. It purifies and heals. Worn in ancient Mesopotamia, Persia, and India to cure fever and prevent misfortune, melancholy, and insomnia. In meditation it opens the brow. Higher guidance, intuition, connection to higher self, overview, decisions for good of all. Organizes and quiets the mind. Opens the throat/Thyroid. Good for Self expression, writing, creativity, dream insight, Anxiety, restlessness, insomnia, autism, shyness, nervous system, MS, speech, hearing, pituitary, DNA, lymph, inflammation, pain (especially head), and protection. 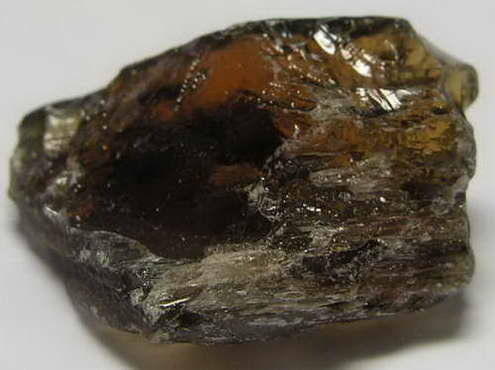 This great mineral provides mental calming while providing strength of will. It increases psychic ability and allows for spiritual growth. It assists with the growth of interpersonal relationships. It was used extensively in Ancient Egypt. Stone of friendship. Helps one to be more kind and helpful, spiritual attunement. Stone of fidelity. Eases eye troubles and asthma. Induces sleep and relieves anxiety. It is believed that a wearer carries the presence of the gods with them. A gentle, soft, sky blue, Caribbean healer. Brings tranquility of water/sea and air to heart and mind. Soothes and uplifts hurt, fear, depression, pain of life, changes with love. Self expression, patience, acceptingness, simplicity, creativity, artwork. Helps gentle people be assertive. Cools and draws out inflammation, fevers, sunburn heat. Especially helps the creativity and throat. Pleasantly uplifts the heart and eases stress. Good for curing the common cold. Larimar works well in conjunction with herbs, especially fireweed and coltsfood. Emotional Support. Helps mind and emotions to be in sync. Powerful high level stone. Strengthens healers and teachers. Opens the emotional heart ans spiritual heart. Unconditional Love and Compassion. Heals abuse, loss, and addictions. Helps emotional balance, confidence, connection to higher self, and oneness. Reduces depression, mood swings, stress, and radiation. Brow and Crown Centers. Deepens altered state, psychic readings, and healings. Helps to center emotionally and spiritually. This mineral is a regenerative agent for the cardiovascular system, opens the heart to love in a balanced way. Peace provider to the Earth. Placed on brow this opens 3rd eye. Enhances psychic images, foresight, consciousness, meditation, and communication. Brings out our natural ability to manifest things into reality via thoughts and visualizations. Promotes tranquility. Provides a higher level of awareness. Opal is a delicate stone, a beautiful stone with a fine vibration. When you look at Opal you can understand how this stone can stand for beauty, lightness, love, and passion. It is seductive. It has been said that Octavius Caesar was willing to sell one third of his Roman Empire for a single Opal. Opal can help you open yourself up to love. It has been called a “Cupid Stone” and said to grant wishes. If you are born in October Opal is said to bring good luck, but if your Opal splits that is seen as a bad omen. Wives and girlfriends gave Crusaders Opals to bring them back safely and bring luck and battle glory. Opal is much more then a stone for love and luck. Enhancing cosmic consciousness allows Opal to open up psychic and mystic visions. Opal promotes astral projection and opens up the mind. It can be programmed for all energies. This energy is healing, creative, and original, even helping you go unnoticed. Working with Opal tends to magnify energy and boost feelings. Helping access and express your true self. Opal is so absorbent and reflective it picks up thoughts and feelings, amplifies them, and returns them to the source. This energy may feel like scattered energy, make sure you are centered before you use it. If you are overly sensitive to energy you shouldn’t wear Opal daily. Opal brings things to the surface for transformation allowing us to take responsibility for feelings. This beautiful stone teaches you that what you put out comes back. 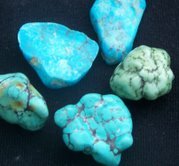 When you are buying Turquoise, make sure that you are using a reputable dealer. Sometimes Howlite is died blue and sold as Turquoise. Most Howlite is naturally white and is easy to color. Any reputable dealer will be honest with you and state whether it is turquoise in color or Turquoise the stone. If you are in doubt, you can ask the dealer to tell you which mine the Turquoise came from. 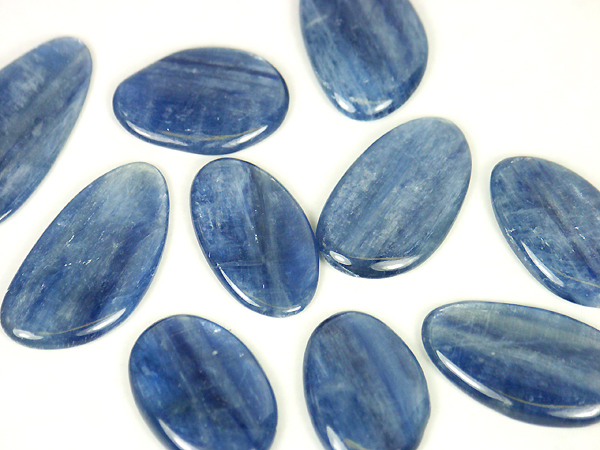 Usually if the stone is very bright blue, that is a good indicator that the stone could be dyed. The following website gives a few examples of dyed Howlite and plastic turquoise beads. Genuine Turquoise will be more expensive, but it is worth it. Turquoise is a stone of immense power and has a lot of legend and lore surrounding it. Middle Easterners believed that it protected from evil spirits and the evil eye. These protective properties extend to riders, protecting them from falls. It even protected against negative energies. The Navajo kept carvings of horses and sheep in Turquoise to guard against negative magic. The bright blue color of Turquoise is said to change to warn of negativity in someone else, the stone may even break. The color can fade when the bearer is threatened with danger, illness, or if under too much stress. Turquoise can absorb the oils in your skin and fade over time. Most Turquoise dealers are now stabilizing the color to help avoid this fading. 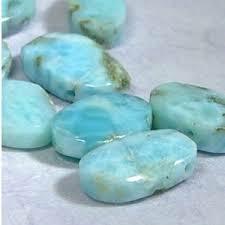 This also helps harden the stone since Turquoise is a relatively soft stone. In Tarot, Turquoise can represent The Hanged Man. This card shows a state of inner peace and acceptance. There is a strong spiritual element to this card; allowing you to understand that what was meant to happen will happen, Turquoise connects very strongly to that. Turquoise in divination is very much a Karma stone. It represents Karma and tells us that now is the time to sit back and let Karma take the reigns. This stone is very spiritual and really encourages just sitting back and letting things happen as they are supposed to. Trust in the universe to take care of you. There is a natural order and it is present and in control, the more you fight it the harder the change will be. Turquoise promotes courage, healing, luck, and serenity. It attracts money and aids in creative problem solving. As a Karmic stone, it helps you understand how things work and where you fit in. This aids in the search for who you truly are. Turquoise is a subtle stone that works slowly and with divine inspiration. Some believe that it controls the weather. Navajo threw it into a river while praying for rain in order to bring rain. Turquoise guides hunter’s arrows. It is a traditional gift for lovers. It is said that it brings happiness and good fortune when given by a loving hand. If there is infidelity, Turquoise will turn black. It provides solace for the spirit and well being for the body. By dissolving self-sabotage, it instills an inner calm that is uplifting. It is an excellent stone for exhaustion, depression, or panic attacks. It helps explore past lives and astral travel. It shows how fate is ongoing. Turquoise is a strengthening stone that unites the Earth and the Sky. Obsidian is igneous rock with inclusions from lava erupting and cooling within the earth. The speed in which it cools prevents crystallization. There are many different forms of Obsidian. Sometimes bubbles get trapped and when they get densely packed that can give you gold, rainbow, or silver sheens to the stone. Clusters of small cristobalite or feldspar can also get trapped in the stone, giving you Snowflake Obsidian. Apache Tears are the result of wind and water smoothing out the rock. Mahogany Obsidian is formed with Iron. Black Obsidian is one of the most commonly worked with forms of Obsidian. Black Obsidian is grounding and centering. It represents strength. This quality of Black Obsidian is why it is difficult to use. While it is used in protection rituals and can allow you to see the situation or enemy when it is hidden, it does this in a very powerful way. Black Obsidian is a stone without boundaries or limitations. It works very fast and with great power. Its reflective qualities are merciless. It exposes flaws, weakness, and blockages. When working with Obsidian nothing is hidden and we are compelled to grow. Some support is lent during this process, but if you are not ready to deal with the issue at hand the stone can be harsh. For example, if you are having money problems and work with Black Obsidian, it can bring the bill collectors to your door. Without dealing with your issues of past spending, you are unable to grow. In order to move past bad credit you have to take care of the bill collectors. It lends you gentle support, but you may not be ready for that step. Negative emotions and unpleasant truths can come rushing to the surface, it can be overwhelming. Black Obsidian brings you face to face with who you truly are. It connects you to your shadow side and teaches you now to integrate the two. Negative energies are magnified so they can be fully experienced. Use with care and only if you are able to consciously process what you will see and only for the highest good. It can be difficult to use if you are not prepared to face reality. Placing it under the pillow can draw out mental stress and tension and calm. It can also bring up the reason for the stress and the reasons have to be confronted before peace can return. This property can lead to nightmares. Sometimes we are afraid of what we need to face. You can combine with Clear Quartz if Black Obsidian is too powerful. Black Obsidian is also used for divination. It is a popular material for scrying. There is a truth enhancing component to Black Obsidian that brings clarity and clears away confusion. Black Obsidian is a talking stone, hold a piece over your ear and listen carefully, it is clairaudient. This stone is also protective, it can block psychic attacks, dissolve emotional blockage, promote compassion, and strength. Black Obsidian absorbs anger and can regroup scattered energies and protect from evil spirit. If you are just beginning your work with crystals it would be better to begin working with a more gentle form of Obsidian like Snowflake, Mahogany, or Rainbow Sheen. Being attuned to the Earth, Aragonite is an excellent Earth healer and grounder. It can help center and ground physical energies, especially in times of stress. It combats oversensitivity and restores balance. If you push yourself too hard Aragonite can help facilitate delegating and help focus. Aragonite can help rid you of nightmares and center during stress. Aragonite transmutes energy from old experiences and paves the way for new ones. It can help reach higher levels of awareness. If you have feelings trapped inside Aragonite can help ease those into the conscious, it can change powerlessness into self-confidence. In tiny mounts this mineral is responsible for the iridescent and pearl like sheen inside the shells of abalone. It is the major mineral in the body structure of some shellfish and coral. The wonderful shape of Aragonite can put on an otherworldly appearance that can create pictures in your mind. During this time of year, the winds are picking up, Marching us along to a more brisk beat as they blow us to and fro. These winds symbolize more for us than new bothersome allergies and messed up hair. They are the winds of change, making room for new things to grow into our lives. New plants are beginning to push their way up through the soil, and new thoughts, people and opportunities are likewise trying to grow their way into our lives. If we cling to old habits for comfort, we are not making room for new and better opportunities to come into our realm. Though an old shoe is predictable and familiar, it is also not as comfortable as a new and more improved shoe can be. Also the new shoe may allow us to walk faster down our life path. As long as we keep such analogies in mind, all the changes this time of year presents will happen much more smoothly. A very suitable stone friend for helping in such times of change is Snowflake Obsidian. This stone is the normal black of obsidian with white flecks in it, thus the name snowflake. It is often called the stone of change, and helps us to emotionally and mentally adapt to changes. In this, we see that the change is necessary and likely better for us though it may not seem so right away as we’re being dragged out of our comfort zone by the change that is presented. Snowflake obsidian teaches us that in an old comfort zone we do not have room to grow. Snowflakes and opportunities are both fleeting, and must be tasted while they’re falling toward us, before they melt away. The gentle grounding of this wonderful stone keeps us centered so that we may think clearly as each change comes with important choices. If we’re too scattered and ungrounded, any choice can be unclear. Snowflake obsidian, worn as jewelry or carried in a pocket and held often, is a wonderful companion when riding the March winds of change. May your emotional and physical spring cleaning bear much fruit of new opportunity. As Always Happy Stoning!